Damen Shipyards has awarded SMST a contract for the delivery of an Access & Cargo Tower and 3D Motion Compensated Crane for the new build Service Operation Vessel (SOV) of Bibby Marine Services. The SMST equipment helps Bibby to safely transfer their maintenance personnel and cargo from their Damen-built SOV to the offshore wind turbines. 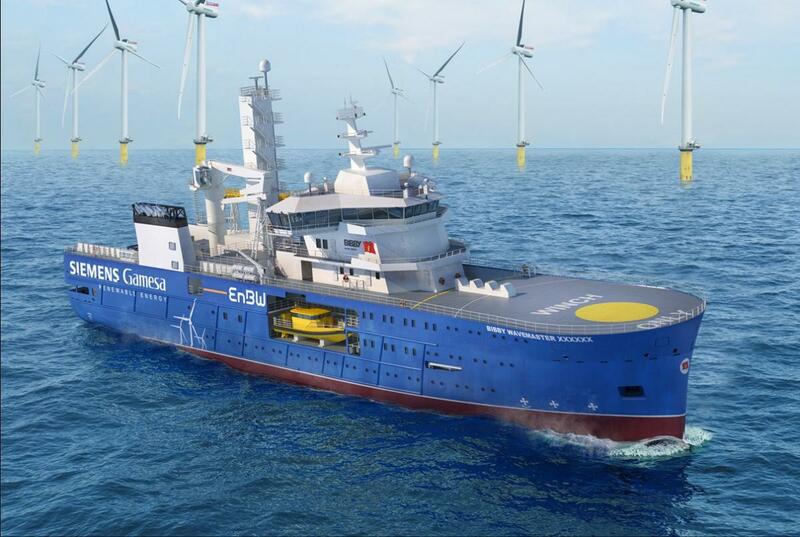 The vessel, sister ship to the Bibby WaveMaster 1, will operate for EnBW and Siemens Gamesa Renewable Energy in the offshore wind farms Hohe See and Albatros. SMST presented an advanced, reliable and competitive package to Bibby Marine Services. It is complete with 3D crane, elevator and motion compensated gangway. The Access & Cargo Tower enables safe and stepless transfer, up to a significant wave height of 3.5 meters. The landing height adjustment system of the Access & Cargo Tower provides access to platforms up to 26 meters above sea level. With the delivery of this system to Damen Shipyards, SMST enlarges its track record of the Access & Cargo Towers to a total of 4. The SMST Motion Compensated Crane, which is part of the contract, is designed to transfer equipment safely to the offshore wind turbines using 3D motion compensation. The crane is able to position the cargo onto the wind turbines or substations, despite movements of the vessel due to waves and current. For Bibby the crane enlarges the operational flexibility of their SOV, that is momentarily being built at Damen Galati, Romania. The motion compensated knuckle performs 3D compensated lifts up to 2 ton and provides a large operational window enabling the vessel and its crew to operate in harsh sea conditions (up to Hs 3.0 meters). SMST will deliver its equipment by Q2-2019, whereafter Bibby's new SOV will be ready mid-2019. The vessel is dedicated to support operations and maintenance work. EnBW and Siemens Gamesa Renewable Energy will charter the SOV for ten years, from summer 2019 until 2029.